Audiotool is a free web app to create music online using their provided free audio workstation and share that music with Audiotool community and everyone outside. The Audio workstation is neat and quite similar to most paid DAWs (as digital audio workstations are usually called). In Audiotool, the elements you add on your interface have to be routed to each other like in real life, better termed as a modular structure. This can look interesting to some but can be tiresome when making big projects. The workstation includes 3 drum machines, 4 synths, 7 flow related tools and 18 effect filters. Apart from all these tools you will be able to browse tons of samples for your sampling needs. 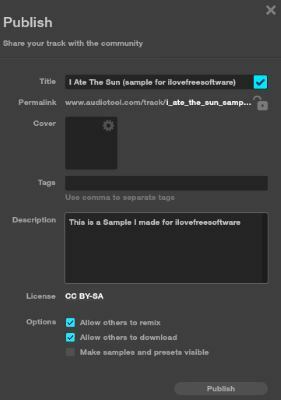 The track will be released under Creative Commons-Share Alike Attributed license which enables others to copy and change your tracks for any purpose, including commercial. The tracks you create can be downloaded easily by other Audiotool users. You, however, cannot download your own tracks. This problem can be solved by using Audacity’s WASAPI Audio Host to record the song as I have done in many cases before this one (scroll down this link and read!). If you like a challenge in creating music, make sure you check out BeepComp. BeepComp will help you make 8-bit music. When launching Audiotool app, you’ll be prompted to choose a template or start with an empty project. So to test it, I chose the empty template which includes Centroid, a mixer and a Master Output. Create a Drum Pattern: Machiniste can have presets loaded after right clicking it. You can choose to make a pattern or load a MIDI pattern saved on your system (Right click Machiniste>Import MIDI Notes). 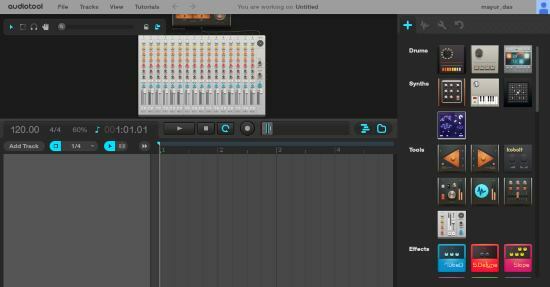 The drum midi pattern will be visible on the timeline, next to its track. If you have a midi controller, it can be scanned and connected in the midi tab, next to the samples tab. Add a Synth: Although I did not add a synth in my track, but I would like to advise you guys to add Tonematrix. 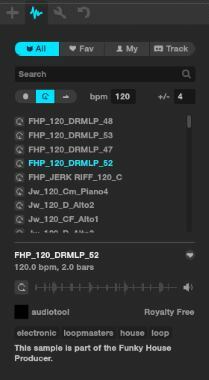 You can create a pattern or import MIDI notes, like in the case of drums. Add Effects and Samples: Samples can be added from the Samples tab, next to Devices. I used a lot of audio samples in my track. These include FX effects, drum loops, vocals and different synth loops. Effects can be added to change the way a certain instrument or the whole song sounds. I liked my track as it is and therefore, did not add any effect instruments from the Device tab. Finally, Tools contains devices for routing, crossfading, splitting and merging the audio tracks. When the track is complete, save it as a draft or template from the menu at the top. The saved project can now be published. Click on Publish to release it on Audiotool. 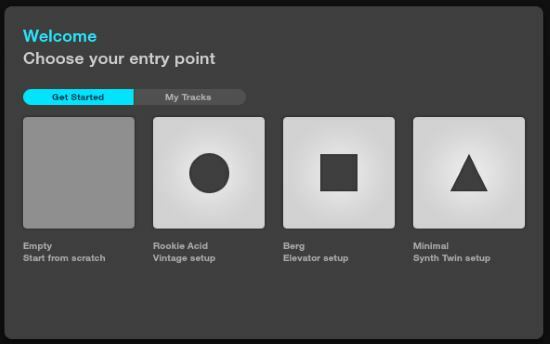 This what your track will look like to users. Your track will be open for download depending on your choice when publishing it. I also published the song on SoundCloud after making a few changes and increasing the bass on Audacity. 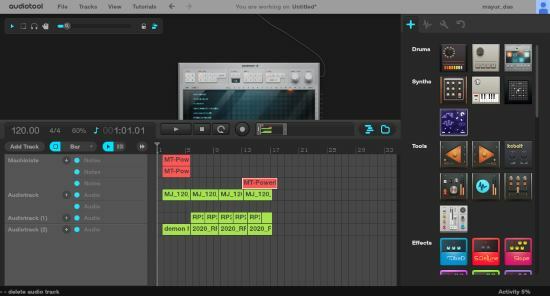 This web app is awesome to make complex hip-hop and electronic tracks. The only thing that I found a bit annoying was its modular structure since I was having problems scrolling in the small interface. I award Audiotool with 4.9 stars.